Before baby girl was born, Jon and I would often make Saturday night our date night at home. We'd get a nice bottle of wine (or two) and pick a fancy menu - usually something time consuming - to cook together. More often than not we preferred these nights over nights out at a restaurant. These days we make dinner a bit earlier so we can all eat together, and while we aren't spending an hour or two cooking together, we are still putting some really good food on the table. 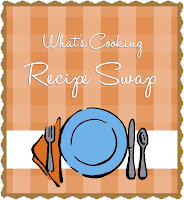 Good food doesn't have to mean hours in the kitchen, and that's exactly the thought I had when I read the recipe I was assigned in this Special Occasion Recipe Swap hosted by A Taste of Home Cooking. 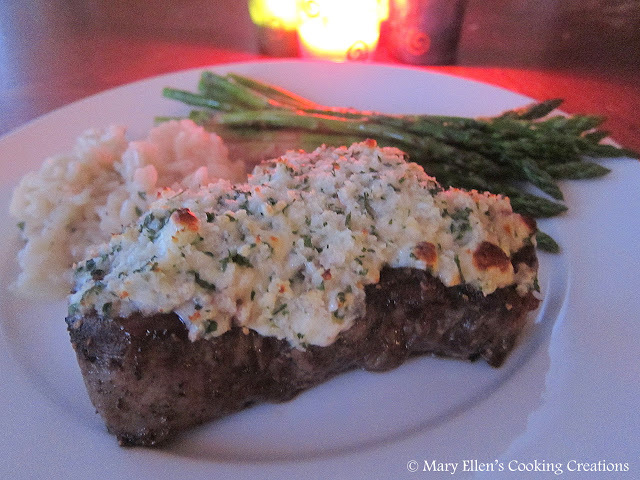 I was given this recipe for Blue Cheese Crusted Filet from the blog The Jey of Cooking. From start to finish, including prep and resting time, this recipe only takes 15-20 minutes, but tastes like something you would order at a steakhouse. I have topped filet mignon with blue cheese before - after it would come off the grill I'd just put a spoonful on top and let it melt while the meat rested. This recipe from Jey makes a nice mixture out of the blue cheese, garlic, bread crumbs, and a few other ingredients. The result is a topping that creates a nice crust, and has more texture to it than just a few crumbles of cream cheese. I served the filet with roasted asparagus and Garlic-Parmesan Risotto. Jey, thanks for sharing this recipe in the swap - I loved it!! In a small bowl, combine the blue cheese, bread crumbs, garlic, parsley and milk and mix until it achieves a paste-like consistency; set aside. Place the skillet with the steaks in the oven and cook for 4-5 minutes for medium rare, depending on thickness (I left them in for about 8 minutes and they were just medium). Remove from oven and turn the broiler on. Top each steak with the blue cheese mixture and place under the broiler for 2 minutes (keep watch so it doesn't burn) until the crust starts to become golden. I love the idea of making a crust with other ingredients to go on top of the steak. YUM! What a simple but flavorful recipe! Oh wow! I just showed this to my husband, who adores blue cheese, and he asked if we can have it tonight! I guess this will be on the menu plan soon in the future.